Veteran actress Karimah Westbrook broke into Hollywood after she crashed an audition for the hit movie, Save the Last Dance. She ultimately snagged the role and almost twenty years later has continued to make a name for herself in Hollywood. 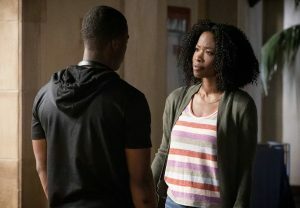 She can currently be seen in All American on The CW as Grace James, the mother of the football prodigy, Spencer. I got the chance to talk with her about her path to Hollywood, what her audition process for All American was like, how she built chemistry with Daniel Ezra and Jalyn Hall, who play her sons, and so much more. Keep reading to see what she had to say! Back in Chicago, I was doing independent films and community plays and there was this film that came to Chicago entitled Save The Last Dance. I crashed the audition, I booked the role, and I made enough money to move to LA after that. That’s kind of the short version of that. Would you credit Save The Last Dance auditions coming to Chicago as the experience that helped you decide that acting is what you wanted to do for a living? No. Before that, I started to take acting much more seriously. I went to the Academy of Dramatic Arts back when it was in Pasadena. They were going to each state to audition people and I auditioned when they came to Chicago. I got accepted and I went there for their summer program. It’s a conservatory, so I wasn’t able to audition for anything and back then, the transit system in LA wasn’t the same as it is now; you couldn’t really get around as easy as you can now, so I wasn’t able to do anything and I knew that I needed to come back to LA to have more opportunities to audition for TV and film. At that time, there wasn’t really an industry in Chicago either… Once I came back, I was like “I got to get back to California.” I started writing out all my goals and what I wanted to do and then that audition just happened to happen. But there were other independent projects in between then. That was just the project that gave me enough money to move back to LA and qualify me to join the union. Over the years, you’ve had a lot of different roles on many different mediums. Do you have a personal acting “bucket list” of roles you’d like to play or genres of projects you’d like to do? Yes. I love fantasy films, people like Johnny Depp and the type of work that he does; he does a lot of character work. When I first started, I did a lot of character work and that was a lot of fun. People ask, “Is there a type of role you’d like to do?” [And my answer is] I don’t know if there’s any particular type of role. I’m pretty open. I just like good storytelling. I find when I watch TV, characters who overcome hardships, like the underdog type, I find very interesting to watch. For me as an actor, I would find that fascinating to live through, overcoming things. But I don’t know if there’s any particular role I’d like to do. Let’s talk about All American, which is one of my favorite new shows of the season. What was your audition process like for the show? My audition process for All American was stressful. But it was all because of me, not so much the process itself. It was the waiting, and [the] not knowing if you got the role [or to even] hear back about if they want to bring you back to audition again. I remember this was during pilot season. I was going out on a lot of auditions and I remember arriving to my audition for All American feeling very tired. Pilot season can wear you out because you can have two auditions every day and it lasts all day. I got there early and I remember sitting in my car being like, “Oh my gosh I’m so tired.” But I remember reading the script and being like, “Oh my gosh I love it. I definitely want to do this.” I went in and auditioned and then they called me back for another audition. Then they told me they wanted to test me for the show, which means they’ve pretty much narrowed it down to a group of actors and they’re going to decide who’s going to get it. Then they told me they would notify us within 5 business days. So you can imagine within those 5 days, I was completely stressed. That part of it for me was very exhausting, just because I kept worrying about it and whether I got it or I didn’t. The day before I learned about [their decision], I went to church and the message was about letting go; it was just so perfect. I remember sitting there in church afterwards, after people had all left, and I was like, “If I get it, I get it. If I don’t, I don’t. It’s just another job.” Then the next day, I turned my phone off and I slept in. I woke up, turned my phone on and had all these messages, including one from my manager saying I got it. What’s really interesting is, I never knew what my reaction would be to booking a series because that was a dream come true for me. When I got it, I was just thankful and happy. I did cry once we got picked up as a series, but when I first heard, I was just like, “Okay great.” You hear stories of people being fired off a pilot and you have to get through all these hurdles. You get the pilot, you shoot the pilot, you wait to see if it’s going to get picked up as a show, then you wait to see if they’re going to pick you up with the show; there’s just all of these things and you never really feel safe. Then, once you start filming the episodes, you’re like, “Okay, I think I’m on it. I think this is for real now” [laughs]. Even then, it’s like, “Oh my gosh, am I going to get along with everybody?” For me, I play a mom and I have two kids so it was like, “Are we going to have chemistry? Is it going to be believable?” But it’s turned out fantastic. I’m having a great time with the show. Kind of going off of what you were just saying about being a mom and building that specific chemistry, I don’t know if you’ve ever played a mother in your career, but how did you go about building that chemistry with Daniel [Ezra] and Jalyn [Hall] Did you have a motherly instinct with them the minute you met them or did that develop over time? I did, I did. I’ve played a mother before on projects in the past and I have a film coming out in May and I’m a mom in that film. I’ve been in situations before where I’ve had kids, so tapping into it wasn’t that far removed. And then I have cousins and I have a niece. I don’t think someone has to have kids to be a mother. I just think you have to have love for children and want them to do well in life. So for me, with the circumstances that were written on the show, I could totally connect to that. Thankfully, Daniel is a fantastic actor, and so is Jalyn. So they made it very easy for me to love and connect with them. Would you say that you, Karimah, are more different or similar to the person that Grace is and why? I think I’m more similar to the character that was written because I do try to look at the glass half full. I think that I’m very driven and I think that I’ve really tired to explore every opportunity to make something work in my own life. I don’t really give up easily and I think that’s very true for my character, Grace. She doesn’t give up easily; raising two kids and being a single mom is a very challenging feat and I feel like she does it with lots of love. I think we’re very similar in that sense with our drive, wanting what’s best for the people that we love, and sometimes sacrificing our own needs to help someone else. The older I get, I probably don’t do that as much but I completely understand the sentiment, especially when it comes to family. I reading in your bio that you also mentor at risk youths who are trying to pursue a career in the arts in South Central Los Angeles. What did you bring from those experiences to the show and your character of Grace? I don’t know what I actually brought from that. Kids are very innocent. A lot of kids, unfortunately, become products of their environment, so I guess I can kind of see that from the center and also just where I was born and raised. But from the center, I guess I learned that kids do need love. Nobody’s ever asked me that; I don’t remember drawing anything from that experience working with A Place Called Home. But I guess in hindsight, it was definitely evident that kids need love and attention. I guess that’s something that I pulled from that, but I kind of knew that already. Gotcha. I just didn’t know because I’m sure a lot of those kids are growing up in neighborhoods similar to where Grace and Spencer live, so I just didn’t know if you had ever thought about that and made that connection. Yeah, that’s a great question. But no, I never did. I know the theory that Billy is Spencer’s real father has been debunked, at least for now, but there’s definitely still some sort of tension between him and Grace. How much do you know about their backstory and what happened between them in high school? You don’t have to say the details if you do know, but do they tell you anything? I get information as I receive each script, so I’m typically just as surprised as you guys are when you watch it. The writers are great. They keep a lot of stuff under wraps, which is exciting but also like, “Oh my gosh. I want to know too.” I have some ideas. Some things have been leaked, so I do have some information. But for the most part, it’s all new to me as I receive each script. Does it make it harder for you, as an actress, having to go in dark and not know the backstory between them? Or does it make more exciting? Initially, for me, it was challenging because I like to create a full backstory and history with all the characters. That helps me live truthfully with all the circumstances and how I relate with the other characters. So for me, it was a completely different way of working from doing films and theater in the past where you have time to build a backstory. So a lot of it, I had to use my imagination and just create circumstances I thought might be it. But I learned [by doing it this way] to be in the moment with everything, cause it’s just like real life; you don’t know what’s coming until it happens. So it just made me switch my way as an actor, which was different me. Now, it’s exciting. Going off of that, what’s it like working with Taye Diggs as a scene partner? Taye Diggs is fun. He’s been doing this for a long time. He’s a solid actor, he’s very fun on set. I’m looking forward to seeing what other things they throw at us together. We also just learned that Grace is going back to night school to finish school. If you had to go back to school for something, what would you want to study? Very cool. Last question — we’re called Talk Nerdy With Us because we all have an inner nerd so what is something that you’re currently nerding out about? I will say something people probably don’t know about me [is] I like bugs and insects and fish and stuff like that. I’m the person who if I’m walking and I see a beetle on the ground, I’ll get out my camera and start recording it. I used to date this guy who was into insects and stuff and I thought it was so fascinating. I was like, “Oh my god. Another bug person!” Now, some bugs, I will run away from. But for the most part, I am very fascinated with creatures and stuff like that. That’s my little thing that I never really talk about [laughs]. So when you find an insect inside, you are definitely a proponent of taking outside rather than kill it? Yes! If you kill a bug in my presence, I just cannot [with you]. I’m just like, “Oh my god no! Don’t kill it. Just put it in a cup and drop it off outside.” I totally save insects all the time from in the house. 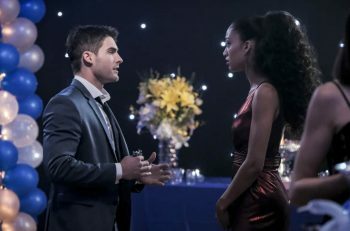 All American airs Wednesdays at 9/8c on The CW. For more information, visit Karimah’s website or follow her on Facebook, Twitter and Instagram .